Mjejane Game Reserve is seeing great wildlife interaction, from regular Big 5 sightings to beautiful birdlife. As the land continues to boast luscious greens, it attracts an array of wildlife for all to experience, and with that, not too long ago we welcomed a buffalo herd of 150 into Mjejane. 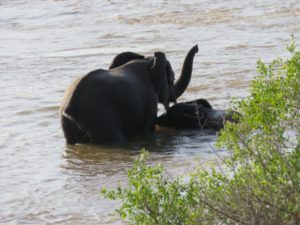 A remarkable scene recently took place along the Crocodile River with a small elephant breeding herd. The elephants experienced some trouble crossing the river, however we saw how these wonderfully powerful animals pulled together. Although most of them managed to cross, a female and calf experienced some trouble in the water. 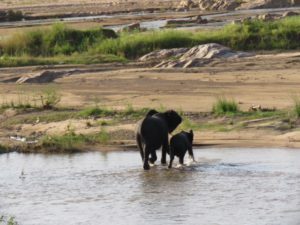 Instinctively, the female steered the calf onto a middle island in the river, and shielded him from the strong current, while he held onto her tail. The herd of elephants that had successfully crossed, turned back to assist them. Other interactions in Mjejane involve stunning birdlife that is currently being experienced. We have seen much more birdlife within our reserve, with the presence of the Lilac-breasted Rollers, European Rollers, along with Purple and Racket-tail Rollers, which are all insect-eating birds. The Racket-tail Roller in particular is a rare sighting at Mjejane, and occurs either in solidarity or in pairs.